Last year, Mind launched major research project, the Big Mental Health Survey. 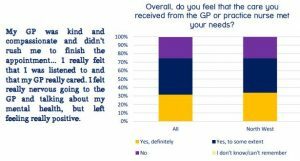 The survey explores people’s experiences of mental health support provided by the voluntary sector and primary care services (e.g. GPs). It also captures people’s experiences of discrimination. We received an incredible response last year. Over 8,000 people who had used mental health services took part, including 1,000 local Mind service users. This has provided important evidence to support our service delivery and influencing work. We found that participants had a better overall experience of care provided by Mind and local Minds (85%), than other voluntary organisations (78%) or primary care services (74%). In particular, people felt that local Mind staff took them seriously, listened to their needs, gave them enough time to talk about their mental health, treated them as an individual, provided easy to understand explanations, and encouraged them to stay hopeful about the future. In the North west, three quarters (75%) of respondents felt that primary care services met their mental health needs, this was broadly similar to respondents as a whole. Furthermore, last year’s survey collected important demographic information from the North West around age, sexuality, ethnicity, disability and diagnosis. Collecting such data is crucial as it enables us to identify groups that are under-represented in our service delivery, and plan future services to meet demand. We are now launching the next wave of the research and we need your help again. 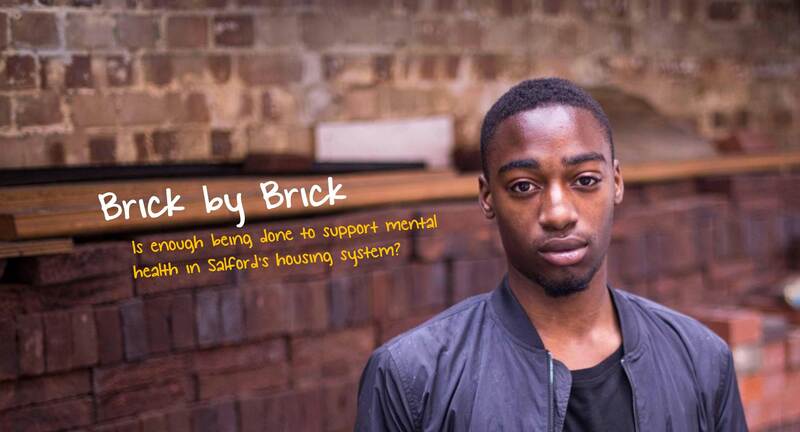 Working closely with our expert research partners, the Picker Institute, we will be surveying up to 10,000 people and we want to hear from even more local Mind service users. The survey is open to anyone aged 16 years or older, with personal experience of mental health problems. We will be collecting responses until the end of October 2018. You can take the survey below and read the results from last year’s report here. This entry was posted on Monday, July 30th, 2018 at 12:55 pm	and is filed under Blog, General, News. You can follow any responses to this entry through the RSS 2.0 feed. Both comments and pings are currently closed.